“Flipping dogs” refers to a money-making practice similar to flipping houses. The flipper obtains dogs for free or at a low cost by responding to ads in newspapers or on craigslist. This person waits a few days, and then “rehomes” the same pet on craigslist for profit. Craigslist makes “pet flipping” way too easy. People can go online, find a free pet and then resell it- making 100% of the profit. If you have to rehome your pet on craigslist, PLEASE be sure to never post “free” in your ad and the screen the potential families to the best of your ability. Ask a ton of questions, ask for vet references. and be sure to get to know the person a little before you give them your pet. I have been on craigslist a lot and I have talked to many people about this new “craze”. One man said that he had to rehome his pet rabbit, and he did so for free. She came with a cage and a ton of food. Three days later, the entire set up was on craigslist for $150. When he finally confronted her, she wouldn’t reply. With more research, I have found this television news story out of Michigan from 2009 – in which a reporter exposes a couple that flip dogs in a “Hall of Shame” segment. Flipping animals is not illegal, just very unethical. Anyone who is using an animal for profit is someone to avoid entirely. They aren’t providing the proper care for the animal, nor do they have anyone’s best interest at heart. Only greed. When animals are relinquished to rescues and shelters, their health is monitored by a trained staff and they receive medical treatment when needed. Precautions are taken to prevent the spread of disease. The staff understands animal behavior and prevents animals from doing harm to each other. Animals are handled humanely. A screening process is used to avoid placing animals with hoarders, flippers, or anyone who has a record of not providing appropriate care for pets. None of these protections exist for animals in the hands of a flipper. I suggest looking in your area for breed specific rescues for dogs and other no-kill rescues and shelters. I generally avoid humane societies, simply because of the high numbers of pets they receive (and the high number of pets that never leave). As always, keeping your pets best interest at heart is what is important. So what can be done to stop these flippers? Sadly, not a lot… Education is the only way I can see this problem ending. One woman did pinpoint a cat flipper in her area, together she and I were able to find out this person’s name and which apartment she lived in! She wasn’t supposed to have cats, so her landlord threatened to charge her for every cat she brought in. Will that stop her altogether? Probably not, but we were able to bring attention to this issue and show her that she can’t get away with flipping so easily. YOU are just one person, but you can make a difference! By replying to those ads on craigslist and by posting warnings, we can educate as many people as possible. If you would like to send an email, but aren’t sure what to say PLEASE feel free to email me (bailingoutbenji@gmail.com) and I can give you the message that I send out. And no matter where you are, feel free to share the picture that I have below. Share it on facebook, twitter, anywhere that you think people will notice. PLEASE consider posting this link in your local CL Pet ads… Reach the problem areas that I can’t! Help me educate as many people as possible! Other sources for dog flipping. Sorry, I just edited that! 🙂 Thanks for pointing it out. This isn’t “new”….it’s been around for years. And the people who do it might surprise many. They pose themselves as adopters, people who have “lost” a pet and even rescuers, both individuals and groups. 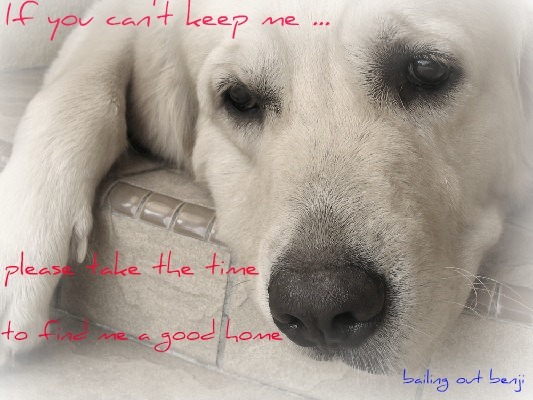 The bottom line is to NEVER give your dog (or any other animals) away for free…. NEVER advertise it in the paper…. It’s best if someone works with a reputable state licensed organization to help them find a GOOD quality home for their pet…period!